Most visitors to Chicago have heard of and are expecting to see the sculpture known as The Bean (officially named Cloud Gate) on their trip to Millenium Park. But if you’ve had your fill of photographing Cloud Gate and you’re feeling hot and sweaty after traipsing around the park for awhile, head over to Crown Fountain. In a city known for its memorable public art, it’s become one of the most talked-about pieces - not least because you’re completely welcome to jump in and make your own huge splash, literally. Crown Fountain isn’t your typical park fountain, either in design or attitude. 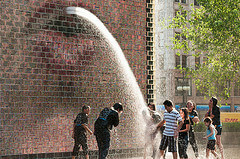 It was created as a video sculpture, and instead of a central structure with a pool around it, there are two 50-foot-high glass brick towers, which display, one at a time, over 1,000 faces of Chicago residents - each appearing to spurt water in a central black-granite reflecting pool out of their mouths, thanks to the clever digital video setup and display. Many people come to Crown Fountain hoping to spot someone they know, although because of the timing of the display of each face, only about 12 different people are shown each week, as the fountain’s programming rotates through its large album. The Chicago Tribune has called the fountain “the greatest piece of public art Chicago has ever known”. Many a Chicago kid (or playful adult!) might agree, even if only because every visitor is encouraged to play in the fountain’s water! No one gets arrested here for hopping into the reflecting pool and horsing around. Which is why Crown Fountain gets more and more popular with the locals the hotter it gets - in the city’s sticky heat, it’s hard to resist the call of a pool where 11,000 gallons makes its way through every hour. At night, when the city turns on the spotlights at the foot of the towers and the extra LED lights between some of the glass bricks, the fountain remains an equally magnificent sight, although the displays of faces are turned off when the other lights switch on. Still, Crown Fountain was meant to be a year-round piece of art, and it can be enjoyed even during the winter months. Although the water runs only between mid-spring and mid-fall, it displays its video images all year. Last updated by jack on 08 December, 2013 in Destinations.